Whilst some cities are struggling with overpopulation, others are shrinking. Urbanisation has been a well-established trend in the 20th and 21st centuries. However, depopulation and deurbanisation in some countries and numerous cities are becoming serious problems for which no good solutions exist at present. People have steadily moved from rural to urban areas to improve their standard of living as well as quality of life. In 1950, 30% of world population was urban. A century later, 66% of people are expected to live in urban areas. In terms of absolute number, difference is stark. 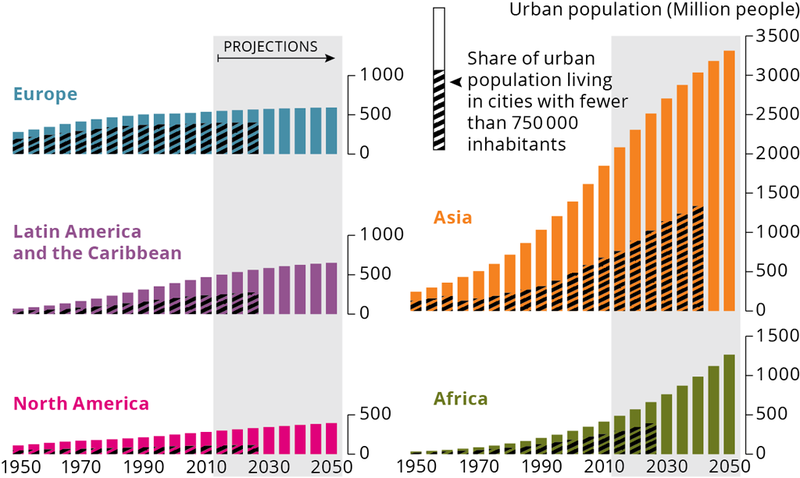 In 1950, 746 million people lived in urban areas. By 2046, it is estimated to be over 6 billion. Deurbanisation happens for three main reasons. First, when fertility rate of a country dips below 2.1, its total population starts to decline and so does its urban population. Fertility rates in South Korea are now 1.17 and in Japan 1.44. Without immigration, a fertility rate of 2.1 is needed to have a stable population. If current trends continue, Japan’s population is expected to decline from 126.5 million at present to 88 million in 2065, 51 million by 2115, and to zero by around 3000! Second, in many cities, jobs in different sectors like manufacturing and mining are disappearing. Between 1950 and 2010, many American cities lost population: St Louis (62.7%), Cleveland (56.6%), Pittsburgh (54.8%) and Cincinnati (41.1%). Third, some cities have lost population due to resource depletion or technological changes. Yichun, a city in north-east China, close to the Russian border, was transformed from a sleepy to a bustling town due to unsustainable logging. Later during 2012-2016, Yichun lost 12% of population after its natural resources depleted. China’s voracious appetite for natural resources to fuel its unprecedented continuous economic growth over the past three decades has meant that some 500 billion tonnes of resources, ranging from coal and iron ore to gold, have to be mined every year. Resource exhaustion and environmental degradation have contributed to rapid depopulation in many urban centres. China’s National Development and Reform Commission has reported that 50 of China’s 390 mining towns have already exhausted their resources that can be economically extracted. This has left three million people jobless, affecting an additional 10 million people. The Commission has given 44 cities the official status of being “resource depleted”. These cities are receiving Central Government funding to rejuvenate and restructure their economies by increasing employment opportunities and improving environmental conditions. More cities will earn this distinction unless natural resources management and environmental protection policies measures are formulated over a long-term basis. Technological development and economic considerations can also contribute to deurbanisation. For example, Khulna, Bangladesh’s third largest city grew 20-fold between 1950 and 2000. Then as the jute industry declined, it lost more than 150,000 people (11% of the population) during 2001-2011. Throughout history, as population increased and urbanisation took place, all types of infrastructure for water, energy and transportation had to be built to meet the steadily expanding needs. All societies have had centuries of experience on how to expand infrastructural requirements. Considerable expertise and technology were developed to meet these advancing needs. What we are facing now is a different type of problem that’s becoming increasingly familiar in both developed and developing countries. How can shrinking cities downsize the existing infrastructure that has already been built as well as to find a usable financial model for operating and maintaining them? Take Leipzig, Germany. During the post-1990 period, numerous buildings were renovated, water-efficient toilets and showers were installed and piped water and waste water facilities were increased by 50%. Consequently, leak detection and repair received priority, and water tariffs were increased to finance the necessary infrastructure expansion and modernisation. All these contributed to major changes in people’s perceptions of the importance of water conservation. The system which was initially designed to provide 200 litres of clean water per person per day dropped to only 92 litres. Fewer users, increased efficiency and less water demand by industries dramatically reduced water demands from 700,000 m3 to only 165,000 m3/day. This meant Leipzig now has a water demand of mid-1940s but a supply network which is significantly above what is needed. This has created new types of challenges. Lower demand means water stays in the pipes for longer periods increasing the risk for bacterial growth and microbial contamination, and thus health problems. Lower water use means lower waste water generation. This contributes to sedimentation in sewer pipes because low flow velocities. Thus, clean water has to be used to flush the sewer system periodically for proper maintenance. Leipzig’s water utility is facing higher operation and maintenance costs, and also higher long-term investment costs for restructuring the water system, with a declining consumption and revenue. Another problem is that the unexpected but serious financial pressure is forcing the utility to focus on possible technical fixes due to lower domestic and industrial water use. This means lower priority to proper operation and maintenance practices will negatively impact long-term sustainability of the utility. In countries like Japan and South Korea and numerous cities are currently facing similar problems in downsizing their current infrastructure availability to meet reduced demands from their citizens and industries. Prosperous cities like Singapore now has to consolidate schools since the number of students have declined. All the resource depleted cities of China will have to consider how best to balance their infrastructure with decreased demands. This is an issue that needs urgent attention from policy makers and researchers, especially in countries and cities where deurbanisation have become a more serious problem compared to urbanisation. While urbanisation is a very important consideration which all developing countries need to manage urbanisation efficiently, a significant number of cities in these countries are witnessing depopulation, and finding they have constructed more infrastructure than they need and can manage. This is an issue that both policymakers and academics have not given enough attention in the past. Within the next decade we have to find cost-effective solutions. It will not be an easy task but appropriate solutions must be found which must be sustainable in operational and financial terms.